The Pirates somehow managed to stumble out of first place in the NL Central to finish under .500 again and the Penguins aren’t even taking to the ice this season, but September was still a good month for Pittsburgh sports fans thanks to the return of their beloved Steelers. Joining them right on time for the first Nike x NFL season have been a couple of Canyon Gold and black classic runners perfect for gameday activities: first an Air Max 1 Premium, and today a release previewed last month from a new series of the model introduced as Air Max III. 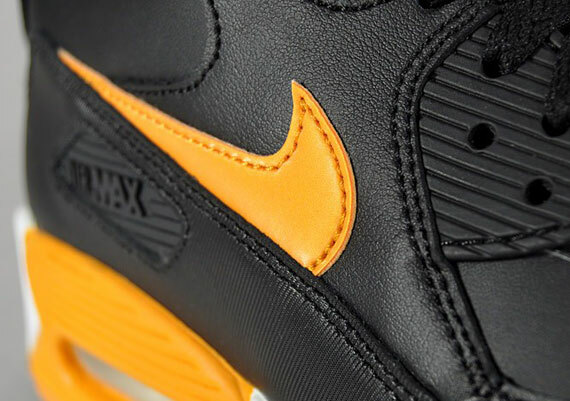 The Nike Air Max 90 Essential proves it’s similar to recent AM1s with the same designation, opting for a simple two-toned colorup with a classically styled leather build whose most expressive component is the subtly textured mudguard. Have a closer look after the jump, let us know how this first Essential Air Max 90 compares to the Hyperfuse-equipped PRM releases and grab yours today at NSW retailers like Shelta.